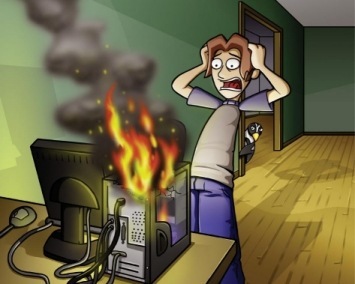 leads to a blank screen, data loss and more serious shortcomings is that your system may be engulfed by fire! You wouldn’t want this to happen. Furthermore, findings reveal that laptops are more susceptible to overheating than desktop computers. This is because the components of laptops are tightly packed and have very powerful processors. Jovago rounds up some tips on how users can stop their computers from overheating. Your system is manufactured to perform at a fixed capacity. However, when it functions beyond that capacity, then overheating is inevitable. In some cases, a system may come with a 2GB Random Access Memory (RAM) but you find some users replacing it with 4GB or 6GB. With this, your system may function beyond the recommended capacity and this can lead to overheating. Computer batteries has a role to play when it comes to overheating. If your system is overheating, one of the signs to check is the battery. If you notice that the battery is weak, it is advisable that you replace it before your system crashes. This is a ‘sin’ that many laptop users commit. That’s placing their laptops on their laps. This is not good for the effective performance of your system. This actually prevent the fan from functioning effectively. The lack of air is a major causes of overheating. A cooling mat helps to regulate the temperature of your system. It ensures that provides the needed warmth for your system. Download an app that keeps track of computer Temp. This is holistic approach to tackling overheating. Users can download apps like core App or real temp amongst many other computer temperature monitoring programms to monitor the temperature of their systems.